How do you produce work that looks authentic? How do you find a voice that feels like your own? How do you say or create something original without feeling like you copied or ripped off someone else? I break down it down into 3 parts: your actual voice, what you talk about, and how you say it. 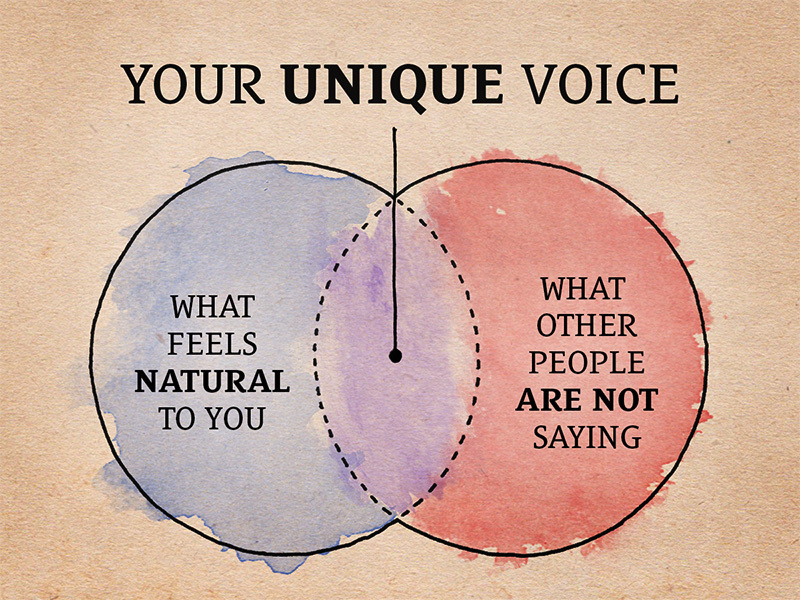 I talk about finding your unique voice in a written or spoken sense, but then also apply what we uncover to discovering your own artistic style. I conclude with how to be inspired without copying and why you aren’t the one who determines your own style. 05:19 Sean: Ben, do you feel like you’ve found your voice or is it something you currently feel like you’re discovering? 08:20 Sean: For me, it’s writing long form first and then condensing that or distilling it down rather than trying to start by working within the confines of 140 characters. It’s just such a small space to convey something. 08:36 Ben: “It really is. I think this practice also helps for long form because you’ve exercised your ability to get rid of extraneous words. So when you’re writing long form, you’re a more efficient communicator. 09:45 Sean: I think that’s what people struggle with in the beginning. They feel like maybe they’re an impostor, or they’re faking it, or they’re not unique. They just don’t feel comfortable. 12:47 Sean: When I listen to screencasts I made in 2011, I was so monotone. It was very uninteresting. I was just using my natural voice, which was very flat. I’m reserved, I’m calm, and monotone was what I defaulted to. 13:35 But it doesn’t make for easy listening and it’s not very intriguing. The listener doesn’t feel engaged in the topic and that just does a disservice to your message. That might be my natural state or my natural voice, but that wasn’t serving my message. It took an evolvement. Even if you go back to the beginning of this podcast and listen to how I talk, it’s different. You can tell a difference. 15:16 Sean: The biggest thing for me in developing my actual voice for podcasting has been purposefully listening back. I write, I record, I listen through to write shownotes, and then even go back and listen a third time. It really, really helps. It’s made all of the difference for me, because I’m analyzing how I’m talking and trying to improve it. 15:38 In terms of what I talk about, I used to just talk about anything and everything. I would project everything I was working on: user interface, icon design, illustration, branding, etc. Then, I started to curate my output. For a while, it was just lettering—lettering work, lettering tips, lettering techniques, lettering tutorials, lettering videos—that’s what I talked about. 16:23 Then I shifted to business, but it was this discovery process of putting a bunch of stuff out, honing that down, and one thing leading to the next. I didn’t know that talking about business or talking about professionalism was my “thing.” It took just putting stuff out to get to that point. 16:46 Ben: “Curating is a really effective and powerful thing. What curating does is it causes you to focus your efforts on a single pursuit and allows you to create a great volume of work in one specific area. When you spread out over many different interests, you can’t produce the same amount of work in the same time. Producing a large volume in one specific area is what really grabs people’s attention. It’s also what helps you find your voice. 18:20 Sean: That’s a great point—all of your efforts were on pursuing a variety of ventures. So you may be proficient in all of those but you don’t stand out in any one of them in particular. In my case, I went all out on lettering. I was all about that. I kept pursuing it and after many thousands of hours and years I arrived to a place where I felt like I had a unique style. 19:37 Sean: Even though I knew a lot of the things that I talk about now in terms of business and professionalism, I didn’t really have a well-developed voice in this arena when I initially shifted my focus to business. If I were to write about those things, it wouldn’t have resonated with people as strongly because I didn’t have the voice. It wasn’t something I was going all out on. 20:34 Well, maybe you get lucky and that’s the case, but there’s no guarantee. That voice might work for them because they came into it naturally and they were being a pioneer in their time. Maybe they weren’t emulating anyone and that’s why they became well known—because they were fresh, and unique and new. If you copy them, you won’t necessarily have that same success. What feels natural to you. What other people are not saying. 22:31 The intersection of the above two is your unique voice. 22:44 I’m going to give my own story to illustrate. For me, it was professionalism paired with my own hyper-logical, no mined words INTJness. Professionalism is what other people really weren’t talking about, and what comes natural to me is being uncompromising. Professionalism is uncompromising. It spares no feelings. You’re professional or you’re not. You’re an investment or you are an expense. You solve problems or you provide options. You are a professional, or you are a technician. Professionals solve problems, technicians provide options. You don’t design for the preferential whim of your client. We are not designing for our client’s happiness, we’re designing for our client’s customers. 23:40 These are things that I started saying and that led to The One Concept Approach. A lot of people didn’t like that—let me rephrase: a lot of technicians didn’t like that. 23:56 You see how I’m being right now? I’m being uncompromising. I’m stepping on toes. Why? Because I’m here to help you be more professional. I’m here to help you be more successful. I’m here to give you the tough lessons and not to sweeten things up for you. I’m not going to do you a disservice. If you’re worrying about what the wrong type of people think, then you’re watering down your effectiveness for the people you want to reach. 26:01 Now don’t get me wrong, I was scared. That’s the point I’m making here. When I put that article and podcast about The One Concept Approach out last year, I was scared. Not scared because I was wrong, but scared because no one else was saying this stuff. You want to be unique? You have to do what other people are not doing—and that’s really, really, scary. It fell in the overlap of that Venn diagram. It was what felt natural to me (being uncompromising). It was what other people were not saying (talking about design professionalism). 28:09 Sean: For me, this ties into The Magic of 7 (Related: e053 The Magic of 7 & Why Your Voice Matters Even When Half a Dozen People are Saying the Same Thing). I’m going to bet that this is not the first thing you’ve heard on finding your voice. You’ve probably already heard other podcasts on this topic. You’ve probably already read blog post about finding your voice. Yet, here you are and you’re still listening to this. Why? 28:33 That’s the magic of 7. It takes hearing something 7 times for it to resonate. This means the people you look up to or inspire you aren’t always going to be saying things that magical 7th time for every person listening. There are a lot of people listening who are hearing those ideas for the first or second time. 28:59 It’s why you’re still listening even though I’m probably not the first person you’ve heard talk on finding your own voice or unique style. You’re all about this one thing—this one particular industry—you need to get outside of that. You need to experience other industries. You need to take in new personalities with unique voices. Put those together. Maybe you hear someone talking about a completely different subject that you’re not interested in, but the way they approach the topic resonates with you. That’s a piece of something that you can take and apply to whatever you’re about. 31:54 Sean: Maybe someone else out there does a really good job of explaining something but they curse through their entire presentation and you realize there’s a large amount of people that don’t resonate with that. Well, you can repurpose that same topic but in your own voice—sans cursing—and you automatically have a new audience. 32:38 You could probably talk about almost all of these topics from a different perspective because you have a different personality. You have a different way of naturally talking about something and maybe other people aren’t talking about those topics in the way that feels natural to you. 33:46 Sean: I want to share my absolute favorite way of being inspired without copying. 34:06 This is something I learned from Erik Spiekermann. What he would do if he wanted to design a typeface in a particular style is he would immerse himself in examples of that style, sleep on it, and re-create from memory. He wouldn’t have those sources up as a reference because that would lead to copying, but he would immerse himself in very diversified sources of examples within this one style and then he would sleep on it. So it’s all in his head—his mind is processing it while he sleeps—and then in the morning he re-creates from memory. It’s inspired by those examples, but he’s not directly copying anyone. 34:57 This is a condensed version of how we all create from inspiration. We’re gathering materials, were gathering bits and pieces of inspiration throughout our day and then when we sit down to create we’re borrowing from this mental bank up of inspiration. Everything we see in real life, online, in magazines, on TV, and in other people’s portfolios we have stored and jumbled together. If you only have one source of inspiration you are naturally going to imitate them. 37:08 Sean: Expose yourself to styles that may not even be what you like or want to do. It helps you diversify your own style. 37:33 A lot of people say to make a mood board and to have this nice, big collage in front of your workspace and look at that reference. No! Don’t do that! Immerse yourself in inspiration and sleep on it. Then re-create from memory with a completely fresh desk. 38:25 If you’re immersing yourself in inspiration all day that’s going to be counterproductive. You going to feel like crap. You probably know exactly what I’m talking about if you’ve done this before. You exposed yourself to too much and you no longer feel motivated. You’re no longer wanting to create. You just feel defeated and you’ve basically quenched the fire with this bucket of inspiration. That spark is gone. 39:44 You have to quit before you go in too deep. Otherwise, you’re tricking yourself. If you just keep hitting next, if you just keep scrolling, if you just keep swiping, what you’re doing is you’re killing the inspiration. You’re no longer a producer in inspiration mode, you’ve gone over. You’ve now switched into consumer mode. You’re taking every thing in. You’re no longer a producer going out and seeking inspiration, you’re just another person that’s consuming what someone else has created. 40:31 Sean: You have to think of this spark like creating a campfire. You’ve got a little spark—if you dump a big huge truck load of wood on that, it will just kill the spark. You need small kindle for stoking that spark. Blow on the spark with some moss next to it so it can catch fire and burn the small sticks. You just need a little bit of inspiration. 40:49 Ben: “With the way that media works today, you can just keep swiping and blow through loads and loads of examples of things you’re interested in. What’s happening is we’re just overloading ourselves and going way beyond our capacity. That’s kind of the definition of consumer: a consumer is somebody who’s taking in way more than they have the capacity to process. Your brain patterns go into this dormant mode. 42:13 Sean: I really like that idea because it forces you to be analytical about it. Even if you’re consuming, it forces you to be in creative mode because it you’re thinking about how you could re-create this. 42:56 If you’re looking at ton of stuff and just hitting “Next” really quick, you’re just flashing images at your eyes. That’s not putting you in creative mode, it’s putting you in consumption mode. Limit your exposure to inspiration. Create from memory, not reference. 43:27 There’s nothing new under the sun, but that doesn’t mean that there’s nothing left for a newcomer to do but copy. I cannot stress the importance of diversification of inspiration enough. Too many new designers simply look to the forerunners in the industry and imitate one designer’s style. 43:45 When browsing, you’ll often notice that the style of a new designer’s work looks remarkably like that of a well-known designer. This is a problem. It’s clear that they have only a single source of inspiration, and they’re simply painting their message with another designer’s brush—one that was hand-crafted over the course of years, and honed through practice and personal innovation. 44:08 It’s not unlike what often happens in the tech industry. One company spends years in the lab trying new things, pushing the envelope, working hard to break into uncharted territory. The lazy company merely lifts the fruits of the first company’s labor by imitating the results. They skip all of the hard work, effort, and research that brought the first company to these conclusions. The first company doesn’t “own” any one particular aspect, but they are the author of the style that they’ve developed over many years of innovating. It is the combination of all the comprising elements that results in the uniqueness that is their resulting line of products. 44:53 When it comes to lettering (substitute your pursuit here), we’re so far from having exhausted all possible expressions of style. There’s more than enough room to be unique in your pursuits. To complain that there isn’t anything left that hasn’t already been done is the whine of a lazy designer.